Simón Trinidad was a banker and a college professor from a prominent family in the department of Cesar, Colombia. His birth name is Juvenal Ovidio Ricardo Palmera and he was commonly known as Ricardo Palmera. Despite his relatively high social standing, Simón Trinidad had many social concerns including concern for the plight of poor agricultural workers and also about issues of peace in his country, ravaged by civil war. How did Simón Trinidad become a member of the FARC-EP? In 1984 the FARC-EP (Fuerzas Armadas Revolucionarias de Colombia – Ejército del Pueblo) and the Colombian Government entered into peace talks. As part of the peace process it was agreed that the FARC-EP would create a political party that would engage in elections. The FARC-EP founded the political party the Unión Patriótica (UP) in 1985. In 1986 the UP came to Simón Trinidad’s home state. He was impressed by their peace proposals and he joined this party in response to some electoral successes, the rightwing death squads began a genocidal assassination campaign against the UP, and over 4,000 members of this party were eventually assassinated. Simón Trinidad began to receive death threats. and, after a close colleague was assassinated, Simón decided he was no longer safe in his home and joined the FARC-EP in 1987. In the FARC-EP he took the name of Simón Trinidad. What was Simón Trinidad’s role in the FARC-EP? Simón worked primarily in education and on political questions in the FARC-EP, When the Colombian government and the FARC-EP entered into peace negotiations at San Vicente del Caguan in 1998, Simón took a leading role as a negotiator, and became well known in the world press and among diplomats from many countries. How was Simón Trinidad captured and extradited to the United States? After the failure of the Caguan peace talks in 2002 the Colombian Government, backed and directed by the United States, began an all-out war in the Colombian countryside that led to massive displacement and human rights abuses. At the same time the Colombian Government began a campaign of persecution against Simón, falsely accusing him of crimes as a high leader of the FARC-EP when, in fact, he was an educator and peace negotiator. In 2003, Simón was sent to Ecuador to make contact with a UN official, James Lemoyne, as part of efforts to revive peace talks wth the Colombian government and begin communication on the exchange of prisoners of war. Colombian Intelligence, with the possible assistance of other intelligence services, were tracking Simón. He was captured in Ecuador on January 2, 2004 and sent to Colombia on January 4, 2004. In Colombia, the government immediately continued their persecution of Simón and asked the US government to extradite him. On January 6, 2004, the US Embassy reported that there were no charges nor investigations against Simón in the US. This didn’t stop the Bush and Uribe governments from concocting charges against Simón, and he was extradited to the Unites States on December 31, 2004 charged with drug trafficking in one case, and with holding hostages in another. The hostage case was based on the capture by the FARC-EP of three US military contractors after their plane crashed while they were filming FARC-EP positions and sending the videos to the US military in Florida. Simón went to trial twice on the drug charges, but many jurors did not believe the government’s case and he was never convicted. The same thing happened with his first hostage trial, but in the second hostage trial Simón was convicted of conspiracy to hold hostages, despite the fact that he had no part in the capture or incarceration of the three military contractors. On January 28, 2008, at his sentencing hearing the prosecutor told the judge to “send the FARC a message.” This Colombian patriot was sentenced to 60 years in prison and was sent to the Supermax prison in Florence, Colorado where he suffered years of solitary confinement. Simon Trinidad remains incarcerated in this prison. Simón’s political extradition and trial, and the inordinately harsh sentence, are a great injustice. Importantly, Simón Trinidad remains a potent symbol of the Colombian people’s search for peace. Simón was named one of the FARC-EP chief negotiators at the recent peace talks in Havana, Cuba. 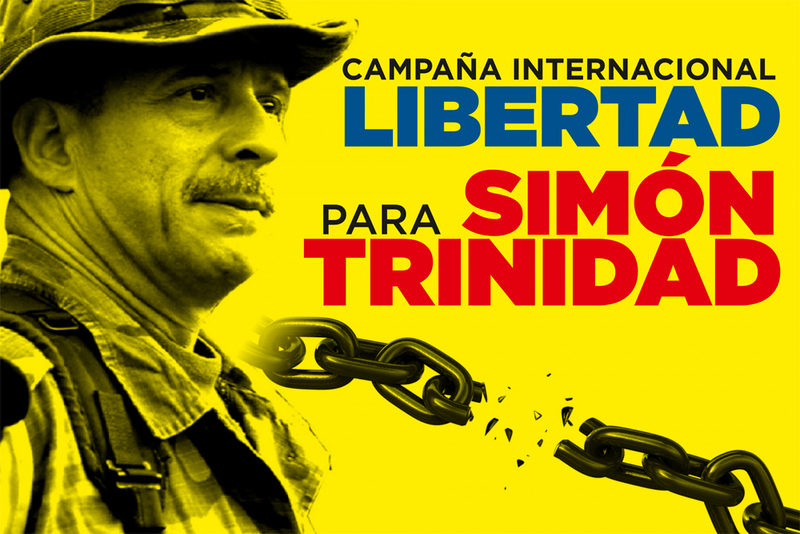 Americans can work to end this injustice and to support the Colombian people’s search for peace and demand freedom for Simón Trinidad!